It’s one of those AdWords settings you don’t think about much. For most of you reading this, if you’ve set up an AdWords campaign, you’ve just left that setting at “English” without giving it a second thought. And, for the most part, that’s what you should do. However, I have a client that recently used Language targeting in a creative way to get customers their competitors were missing out on in a highly competitive market. We’ve done a great job optimizing his AdWords account over the last few years (though I am a bit biased there!) and, without a significant increase in budget, there’s not much room for improvement at this point. However, his business is in a U.S. city with a decent size Spanish speaking population. So he set up a new Spanish language version of his website and we set up an AdWords campaign using Spanish language ads. 1. 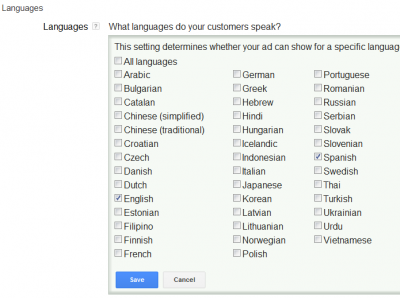 The Language setting in AdWords asks you to select the languages your customers speak. Make sure you select BOTH Spanish and English as shown in the screenshot below. The reason to do this is this setting targets users by the specific language setting they use on Google. What I’ve found is that a lot of people keep their language setting on the default of “English” yet they still type their searches in Spanish. By selecting both Spanish and English, you’ll cover your bases and make sure your ads show up when someone types in a Spanish phrase no matter what their Google search settings are. 2. Converting English ads to Spanish can be a bit of a challenge because the Spanish translations are often much longer than the space allowed in an AdWords ad. You’ll need to work with a translator (or, as I did, rely on 4 years of high school Spanish) to tweak the ads enough so they’ll fit within the AdWords limits. 3. This should go without saying, but make sure you have someone on staff who actually speaks the language you’re targeting so you can actually help those who contact you through your foreign language ads! The clickthrough rate is about 6 times higher than the English language campaign. Th costs per click are about a half of those in the English language campaign. Yes, the number of impressions and clicks are a fraction of what’s generated by the English language campaign but, for not much in ad spend, the Spanish language campaign is generating a solid ROI. It’s often hard for small businesses to compete in highly competitive markets in AdWords. But that’s no reason to throw your hands in the air and give up. You can out-think your competition and carve out small niches where you can win – just like we did here using Spanish language ads. No, these Spanish language ads aren’t going to have a huge impact on the bottom line for this business. But they are generating an ROI and the client is getting a few new clients each month that he wouldn’t have had otherwise. And, if you can exploit enough of these smaller niches (whether in AdWords or other forms of marketing), they can all add up to make a very significant impact on your business.